I often get asked to present to organisations on the topics covered in my books and articles and I really enjoy working through the topics with audiences. Below are examples of recent talks I’ve given. If you’d like to discuss a session for your business about the real implications of technology and innovation, then please get in touch. Exploring the 3 big trends in retail, this session looks at the accelerating impact of technology on one of the most crucial sectors in the economy. Self Driving Cars are not just a technical challenge. The regulatory framework and the public perception are vital influences on the evolution of this technology. Consider the real-world challenges to deployment and the 2nd/3rd order impacts. The truth about AI’s impact lies somewhere between the extremes of dystopian despair and a panglossian panacea. This session introduces the key topics of AI, explodes some myths and explains its importance to businesses of all types. The easy adoption of technology is over. Emerging technologies pose real challenges to businesses, to individuals and to society as a whole. We need to rethink our relationship with technology and spend some time understanding the scale of change if we’re to realise the benefits without suffering undesirable consequences. One of my favourite ways of looking at technology is Amara’s Law - “We tend to over estimate the impact of technology in the short term, but underestimate its long-term impact”. Despite the pressures of day to day operations, businesses somehow need to be looking further ahead to avoid becoming irrelevant. What practical steps can you take to keep one eye on the future without losing sight of the here and now? What happens if we stop using cash? While it has advantages for businesses and many consumers, there are also significant communities who stand to be disadvantaged. This session explores innovations in payments worldwide. Logistics and Supply Chain operations have become vital differentiators. This session looks at the myriad technologies now revolutionising logistics and especially deliveries. 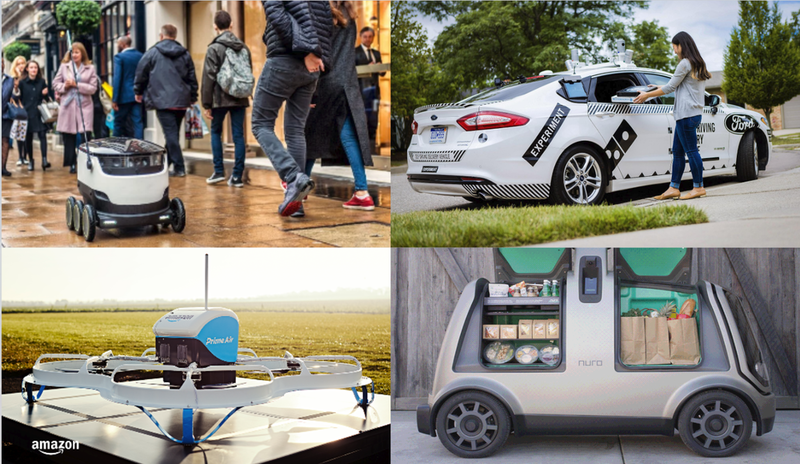 From drones to sidewalk robots to self driving cars to gig economy workers, any business that delivers needs to keep up with the options. The advent of driverless cars will revolutionise the world in the next decade. The decisions we make about driverless technology now will shape our society for generations to come - this session explores the changes and challenges ahead, with a special focus on the new businesses it will enable (and the old ones it will upset).